Oh! My Goddess! Belldandy (Doll Profile #8) – How Do You Figure? First, a little history. I credit Aa! Megami-sama as the property that revived my love for anime back in college. I had been a fan since high school, but had fallen out of it during my freshman year of college. One day, I was browsing a video store during its “going out of business” sale in 2002 and I happened upon a very shiny, very beautiful box. It was a copy of the Ah! My Goddess movie. Intrigued, I picked it up and brought it back to the dorm to watch. I had never seen (or read) any of the story, but I was immediately intrigued. The main male character was actually intelligent and the main female character was (quite literally) divine. After watching the movie, I quickly tracked down the rest of the content that was available at the time, including the OVAs and manga. I couldn’t get enough! 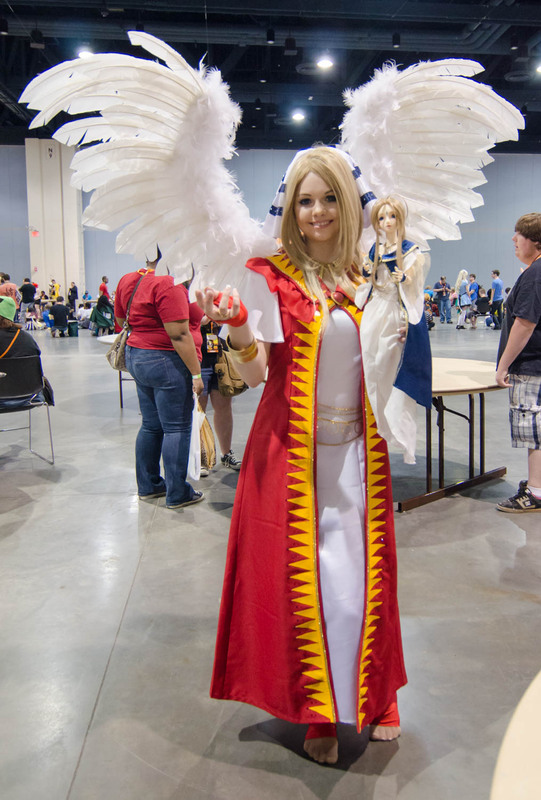 Given that history, I knew that if Belldandy was ever made into a doll, I would absolutely have to have her. Volks was now giving me the chance and I wasn’t going to let this one go. The fact that she was resin scared me a bit, but I knew I could lean on the community around me for help and advice! There were enough resin owners around to get me through my first. With all that in mind, it was time to enter the lottery! Given my track record with Volks Japan, I didn’t even bother putting an entry there and went straight to Volks USA. It also appeared that Volks USA had more options and allowed prospective purchasers to choose additional services for their dolls. Since this would be my first major resin doll and she was going to be such a big purchase, I opted to add the Sato-gaeri service. This meant her joints would professionally sueded (with leather!) and her parts would be coated with an anti-UV satin spray. The entry went in on December 20, 2013. Belldandy was coming home! With a target delivery of May (due to the Sato-gaeri service), it was going to be a few months before I’d see her in person. With this being Volks, this wasn’t going to be the last email I got from them. Nine days later, this email came in. It turns out Volks doesn’t normally sell hands for the SDGrG outside of the release windows for dolls. They aren’t parts you can normally order or purchase from the in the store, meaning this was the only opportunity to get the complete set of option hands! They were also selling spare wigs, in the chance something happens to the original. Yup, more money going Volks… Hands were $55 each set (I got 3) and the spare wigs were $77 each. The additional order came to $242 plus shipping. If you’re keeping score, we have the base doll, plus Sato-gaeri ($189), plus special Sato-gaeri ($55), plus option hands ($165), plus spare wig ($77). That’s nearly $500 in extras on top of the base doll. I knew Volks resin was considered cream of the crop, but this was getting ridiculous! Fortunately, the emails from Volks stopped until the ship notification on May 12, 2014. She’d finally arrived in the US from Japan complete with all of her extra services. Her workover was done in Kyoto by the professional Doll Doctors there, and she was ready for me to take delivery! She arrived at my home on May 16, 2014. I stayed home that day to wait for UPS to arrive with the box, as I didn’t want to run the risk of missing the truck. The box ended up arriving early evening (I totally could have gone into work that day) and I managed to wait until some friends came over before opening her up. Unfortunately, there aren’t a lot of pictures of this, as I was far too excited to take any…. Up until this point, I had only had Volks vinyl dolls. I’d seen some resins in person, but nothing could prepare me for the sheer difference in the experience. After opening up the packaging, it cemented my belief that Volks treats its resin line as the top end product, with the vinyl dolls being a secondary line. The box was of much higher quality than anything I was used to with the DDs. The box was a super dense cardboard with some weight to it and the entire surface was textured. The name was printed in beautiful gold script that just oozed quality. Inside the box, everything was beautifully laid on the pillows and the fragile bits were carefully wrapped in bubble wrap. 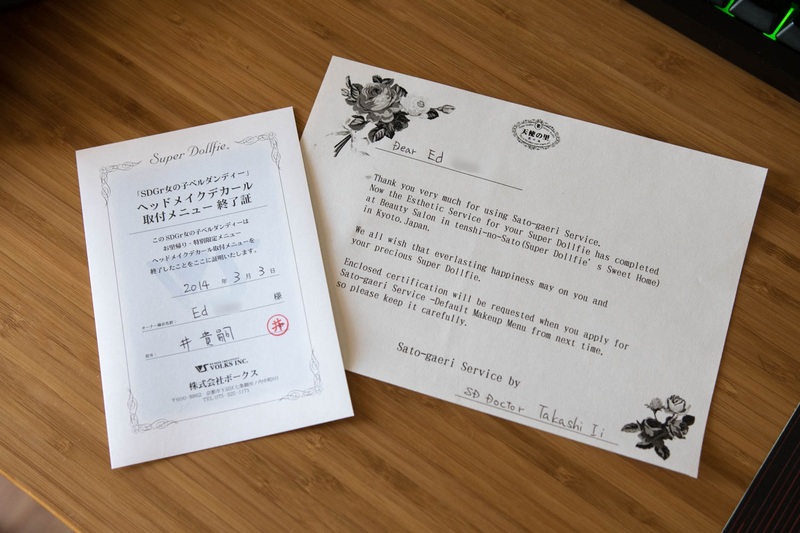 On top of that, her packet of documentation included a special note signed by the person who performed the Sato-gaeri service, as well as a certificate with the service date, my name, and person who performed the service. All of this was placed in a gorgeous envelope with the Tenshi-no-Sato logo on it. The certificate served as the pass for if you would like your doll’s faceup reset to default (if it was ever modified). The unboxing was almost bittersweet. It was an amazing experience, but at the same time I knew I’d likely never see something like this from Volks again, unless I bought another new resin doll from them. For Belldandy herself, I absolutely adore her! I’m actually really glad that Volks decided to make her as a resin doll instead of vinyl, just because it gave her a different look. A lot of people complained that they would have preferred a DD version, however I’ve always though the resin aesthetic suited her soft-natured character better. While I never minded her design from the TV anime, the resin style gave her more of a classic “early manga” look. The other thing that I love about Bell is her sheer versatility. She can make anything look good, even American Girl clothing! Since she’s an SDGrG, she has more realistic proportions, rather than the more exaggerated proportions from a DD. She’s wider at the waist and a bit broader at the shoulders. The more advanced resin body from Volks also meant her hands could easily be removed for changing or dressing. A nice touch for someone used to the DD line! My only disappointment associated with her so far is that I wasn’t able to show her to Kikuko Inoue (Belldandy’s voice actress) at Animazement a few years ago. It’s OK though, I settled for having a cosplayer take a picture holding her!